Hey Guys! 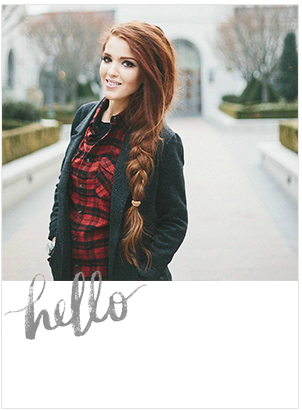 I'm Emily and I blog over at The Freckled Fox. I'm eager to share this easy tutorial to achieve this beautiful and romantic side braid, because it's absolutely perfect for this time of year especially and can be worn for so many different type of occasions. It's also one of those neat styles that look way more complicated than it actually is while still being easy and effortless looking, so you're sure to get tons of compliments:) Lets get started! 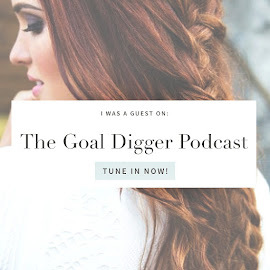 Dana's blog! Notes: If you already have texture in your hair then leave out the dry shampoo otherwise spry a bit on for some grip. If you want to tease your crown a bit for volume then use a teasing comb before you get started, and if you have silky or fine hair(like me!) then you'll want to include some hairspray to help the style hold in place longer. Steps 4-6: (4) Continue your french braid down as you remember to add in a little more hair from each side before you send that section over and under (it helps to say "Add, over, under. Add, over, under." to yourself as you french braid if you're a beginner:)) Tie off your braid with a hair-tie once you reach your ear so we can work on the other side. (5) Twist the hair above your opposite ear upwards and back, tugging a bit of hair out at your temple to keep it loose and flowey looking, and (6) swoop it around the back to join it in your braid. Steps 7-9: Now that you have all of your hair in one hand, proceed to turn your french braid into a fishtail by splitting it all roughly in half and grabbing a small chunk of the hair from the back of your right section. 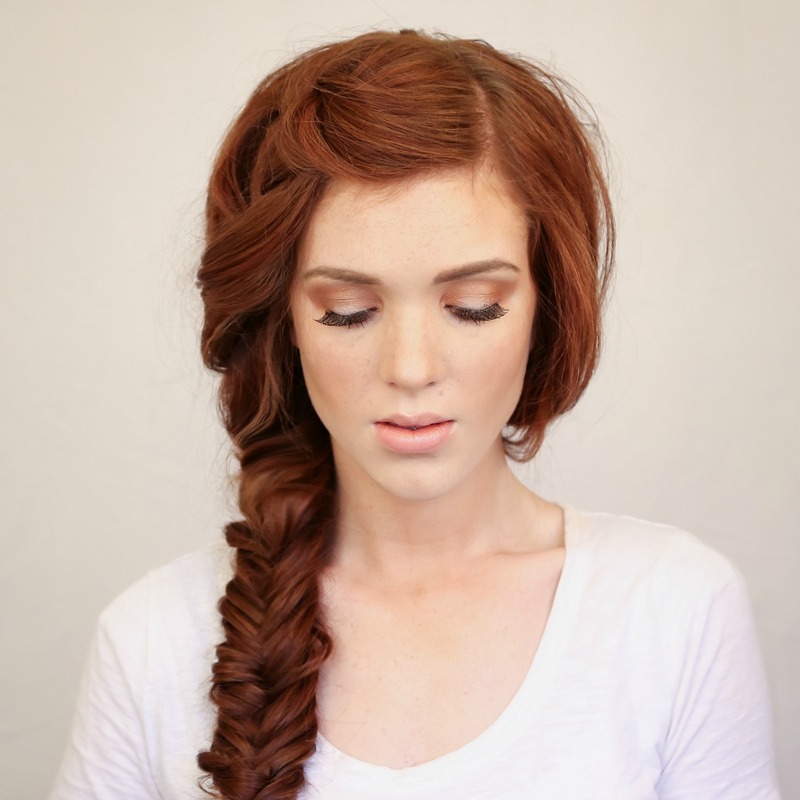 (7) Bring it around and over the right section, combine it with the left section, and now repeat that with the left side, back and forth alternating till your fishtail braid really starts coming together and you have the length you want. (8) Finish it all off by tying up the braid with a hair-tie, and by tugging your hair out here and there to loosen everything up. (9) Spray a bit with some hairspray if you want and you're all good to go! Remember to not worry about it being perfect while you do your braiding because we're going for a really textured and kinda messy finished look anyways! Also as a final side-note, a fun thing to do would be to tie a ribbon around your hair-tie once you're done to add some old-school femininity to the whole look:) And you're done!! Also how do you like the new look of the tutorial overall? I love how the look is more clean and carefree, and the first thing you see is the style. That's really what I was going for and I love how this one turned out. We've had a somewhat quiet weekend here on the blog since we were surprised with a visit to some of my favorite family over the weekend. Our trip was kicked off with them taking the kids overnight on Friday so we could have an Anniversary date! This week is going to be chalked full of some lovely and long awaited posts, some being doubled up: the rest of 'Anniversary Week', recipes, style posts, YouTube, more hair, etc. Can't wait! Thanks for visiting, and here's to a brand new Spring week! love your hair!!! makes me wish i hadn't cut mine! great hairstyle! Perfect for those warm summer nights! Breathtakingly beautiful! I love the new design. Wow - great hair! That is such a romantic look! You seriously have beautiful hair! I love this look! Wow, one of my favorite to date! 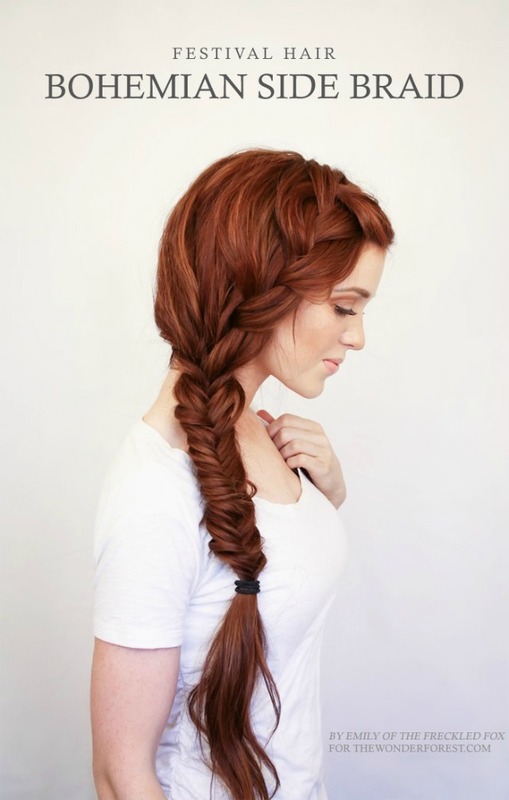 Such a pretty braid! I'm never able to braid my hair over my ear like that, do you have any tips? Loveeee this! I just cut 12+ inches off of my redhair.... Wishing I wouldn't have cut it!! Beautiful hair!! I love the color! LOVE your hair!! Beautiful color and braid! I love your hair AND your makeup. Have you done a makeup tutorial yet? Thanks for sharing such a nice information on hair style it was really helpful one for me. Thanks for this! It seemed daunting to try at first, but I did it for a wedding and now I do it all the time for day to day. I have really thick hair so it's easier for me when I do it with my hair wet, right out of the shower. Totally holds the rest of the day and I get tons of compliments. Love your braided hairstyle! Thanks for the comprehensive tutorial! I like styling my hair in braids. I find it convenient and super attractive! I love braided hairstyles with the whole heart. 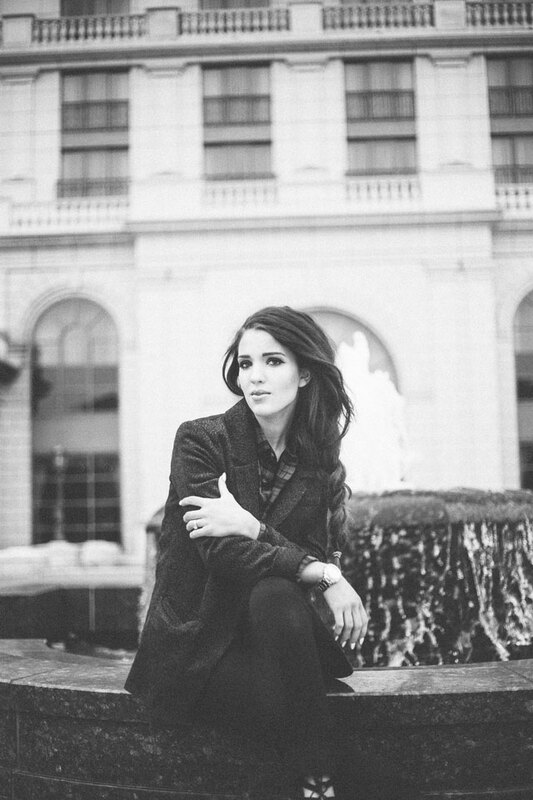 Beautiful hair style for those with thick and long hair…for those that don’t hair extensions could be the answer! This is the absolutely gregarious side bride hairstyles ..thanks for share helpful and informative tutorial. Love the hair style. Got a bit confused as to how to joint the braid with the other hair.